There must have been a question like: “What are your feelings about climate change?”, because it’s all about scientists stepping outside their ivory towers and exposing their inner selves. It’s interesting, and there are replies from such well-known names as Michael Mann and Kevin Trenberth. You can read the whole thing in twenty minutes, though I doubt that many people will. So I thought I’d do a bit of Cook/Lewandowsky-style thematic analysis and try and see what it means. Totting up adjectives is obviously an inadequate way of getting a feel for the feelings of intelligent people, but already the results are quite startling. These are people who are doing work they consider vital; they’ve been collectively awarded a Nobel prize and received the praise of almost every leader on the planet. Billions are showered on their research, with more trillions promised. 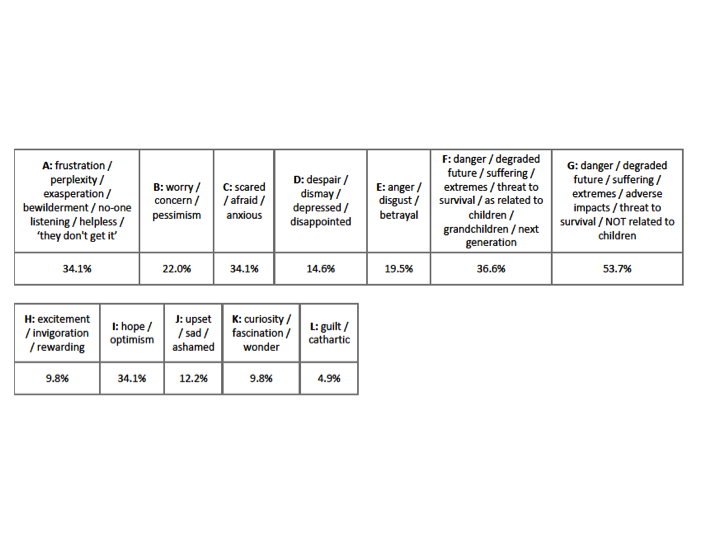 Yet over a third of them (12 out of the 34 who expressed feelings) feel Frustrated, with Anger, Worry, Sadness and Fear being the follow up sentiments. Totting up all feelings expressed bumps up the figures for the negative sentiments, and adds a new important positive one, which can be characterised as “motivation” or “job satisfaction”. It’s nice to know that many of them enjoy their work, but still disturbing that so many of them have such overwhelmingly negative feelings in general. Anyone who’s been involved in opinion research knows that “unprompted” requests for opinions rarely elicit large responses, yet here we have about a third of all those who express any feelings describing themselves as angry, another third as frustrated, and a third as worried. About a quarter were afraid, a quarter sad, and a quarter amazed. The image of scientists as cool unemotional pillars of rationality takes quite a knock. On coral reefs climate change effects are hugely obvious and very depressing. Huge swaths of coral have died due to heat stress and more will continue unless drastic changes occur. It is very hard not to feel totally overwhelmed by the magnitude of the problem and depressed by the extreme apathy of most of the world’s population (it seems) towards doing anything about climate change. I feel exasperated that it is taking so many decades before society gets serious about the challenge posed by climate change – speeches and declarations, yes, but nothing has been done that measures up to the challenge. In other words, the problem is us: society; politicians; “the current state of public discourse”; or nothing less than “the world’s population”. Anger: Climate change has become everybody’s lightning rod, a route for conducting vast charges. Contrarians want to use it to beat up the left; the left want to use it to beat up capitalism; despair junkies want to use it to beat up everybody. Truth doesn’t stand a chance. My frustration with these greedy, lying bastards is personal. Human-caused climate disruption is not a belief – it is one of the best-studied phenomena on Earth. Even a half-wit can understand this. As any father would, anyone threatening my family will by on the receiving end of my ire and vengeance. This anger is the manifestation of my deep love for my daughter, and the sadness I feel in my core about how others are treating her future. Mark my words, you plutocrats, denialists, fossil-fuel hacks and science charlatans – your time will come when you will be backed against the wall by the full wrath of billions who have suffered from your greed and stupidity, and I’ll be first in line to put you there. Imagine how a medical doctor feels having to inform their patient, an old, life-long friend, of a dire but treatable diagnosis. The friend angrily disregards what you have to say, for a variety of very human reasons, and you watch helplessly as the pain and illness unfold over the rest of their shortened life. There is a similar closeness between climate scientists and the planet… Returning to our patient, I feel frustrated that my friend won’t listen. But I hope they will listen to other doctors and come accept the diagnosis… I hope that we see ourselves as the patient. How do I feel about climate change? Afraid: for my grandchildren, for my family, for people. That keeps me awake at night. Angry: fossil fuels cause terrible pollution and climate warming that lead to millions of deaths every year, and many millions sickened. I am both fascinated by and frustrated by climate change […] Understanding a little bit more over time is thrilling. Then I look at my children and think about what I know is coming their way and I worry how it will affect them. I feel concern that we will leave behind a fundamentally degraded planet for our children. I feel concern that my 8 year old daughter, her children, and grandchildren may end up asking why it is that my generation failed to act in time to avert a catastrophe. I feel concerned that we are doing damage to the planet. I don’t want to leave a mess for my children, or anyone else’s children, to clear-up. I am the son of a farmer and both of my grandfathers were farmers and my wife’s father was a farmer – we grew up with the concept of being stewards of the land and we care about the future abilities of farmers to be able to feed the world. I am also a father, with 3 sons and currently 3 grandsons. I am greatly concerned about the legacy we are leaving them ..
Of course, nothing is more natural than concern for one’s offspring, but the insistence with which this theme – or meme – comes up is rather disturbing. It came up in Chris Rapley’s show “2071” at the Royal Court Theatre, 2071 being the year his grandchild would be the age he is now, or something. I’ve experienced it in peculiar menacing comments from warmists on blogs of the kind “I hope you live long enough to see what you’ve done to your grandchildren”. I have two tentative explanations. One sees it a symptom of the role of climatophobia as an ersatz religion. As atheism becomes more common, so does a search for something to believe in, and an obsession with the blood line is a handy substitute for the belief in personal immortality. An obsession with what my grandchildren will go through is a disguise for the unpleasant suppressed thought that I won’t be there to know. The other explanation sees it as a symptom of the general loosening of social ties in the modern world, typified by Mrs Thatcher’s famous remark about there being no such thing as society, only individuals and their families. Long ago I used to conduct focus groups for market research companies, sometimes on sensitive political questions. Whenever discussing subjects of great social import like welfare benefits or race relations, there’d always be some awkward bugger who felt uncomfortable or bored discussing such weighty matters and would short-circuit the discussion with a remark to the effect that “the only thing I care about is my family” – reiterating, or even anticipating – Mrs Thatcher’s catch phrase. I find it odd that scientists who claim to be acting to save the world from itself should exhibit the same blinkered attitude. In 1972 I ran into a little book, “Inadvertent Climate Modification”, that outlined the problem we face today. I was convinced right then that this would very likely grow into a serious problem. Today we know much more about past climates and the massive impact we have on the atmosphere, oceans, and ecosystems. Every year there are more warning lights that start blinking red. They may start blinking red, but they end up bleeding green. 42 years before the IPCC announced that it is 95% sure that man is influencing the climate, a young man ran into a little book that convinced him that climate change would be a serious problem. Who needs science, with its bothersome experimental method, when such a tiny cause as reading a book can have such profound long-term effects? Or, as the Chinese proverb has it: “Flap like a butterfly, sting like a BSc”. Tags: feelings, scientists. Bookmark the permalink. My word to express my feelings about this is LOL and that is not even a word. I think Professor Michael Raupach nailed it; despair junkies. I have an analysis along the same lines, but in the context of the wider emotional bias as a main driver of the climate Consensus, and including video soul-baring and the ‘scared scientists’ series as well as these letters. How does one “feel” about someone who would say something so ludicrous? The human condition has improved tremendously in this fossil fuel age. Do climate activists feel so invincible that they feel they can say anything, no matter how absurd? Like the site, good luck with it. My sense is that Duggan hand picked these moaners and groaners. For the most part they come across as a bunch of “Silly Cnuts”, to borrow an expression from another recent article. The celebrated Kevin Trenberth for one, was delusional enough to put his name on the infamous and bizarre RICO letter to Obama. Richard Lindzen was prescient and correct in his evaluation of the caliber of scientists specializing in climate science, here is some of the evidence. To be honest this post is giving publicity to an article which I certainly could not be bothered to read. Who cares what they feel? This subject is supposed to be scientific and this article is all about emotion, and that is what climate alarmists want. We need to concentrate on the scientific facts – the data on climate and the utter foolishness of the alarmist response to it. It’s really worth looking at the ‘Scared Scientists’ emotive texts / photos and the ‘Speaking from the Heart’ videos for even more expressive material along the same lines as these letters (links are in the Climate Etc guest post I noted above). I think your first explanation is most certainly along the right lines, i.e. the main drive is cultural. Religions are just a special case of culture, there are secular cultures too and both types have the same basic social mechanisms beneath, of which emotive memes are a major part. The ‘save the children / grandchildren’ meme is both very highly emotive (deep gene-line preservation instinct) and also part of the reward system (secular cultures cannot offer true salvation – e.g. going to heaven – like religions can, so they have to use ‘salvation substitutes’ instead as part of their reward). But whatever subtleties are or aren’t associated with the explanation, it’s clear that these scientists who are so hugely emotive have lost all objectivity regarding their subject. They *believe* emotively in the certainty of calamitous outcomes, rather than deducing these from available data. Enormous emotive bias. For instance most of what they say is not even supported by the IPCC, which purports to represent the science but in any case could hardly be classed as moderate. Strong positive emotions, e.g. hope that the fear will be removed, or of a New Order, are just as biasing as strong negative emotions, like the fear / anxiety / worry. Co-evolving memes within a culture hang out together such that fear / hope and various other emotions in us are manipulated in a coordinated way (via differential selection, there is nothing agential or sentient going on). Much more colourful and perhaps considerably more fun. I once did one for example on a document attesting to professional competencies. The most frequently used word that emerged was ‘appropriate’. It helped enormously to make a certain point to an audience. If you’ve a little bit of time to spare, it’s a great way to pass a few amusing moments and utterly stupendous to see up here. Best wishes for this new site. Manfred, thanks for the suggestion. 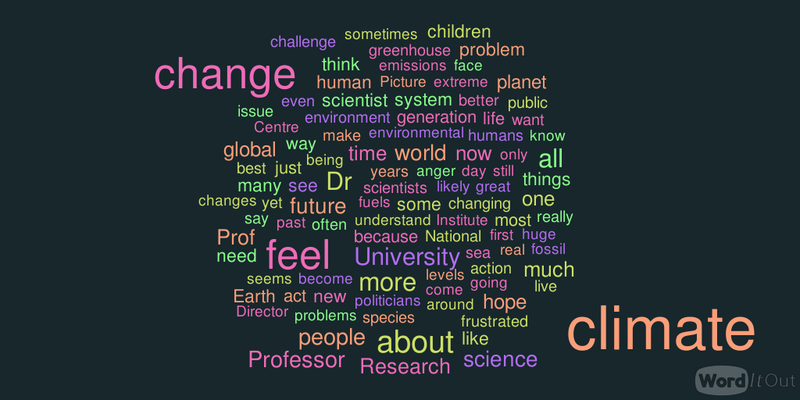 I have done a word cloud using “WordItOut” (Wordle didn’t work for me) and added it to the post as an update. As one might perhaps anticipate, we see feelings expressed most frequently in the following words ‘climate’ and ‘change’, followed by ‘feel’, ‘about’, and ‘dr’, ‘professor’, ‘university’, ‘research’, ‘all’ – at a quickish glance. The consensus appears alive and well….this almost has the makings of an excellent Delphi Study. The comment by Pieter Tans is intriguing. He says that he read a book in 1972, “Inadvertent Climate Modification” that ‘outlined the problem we face today’ and convinced him that climate change was going to be a serious problem. Now, I was not aware that any book published back then said that man-made global warming was going to be a serious problem in the future. So I found the book, published by MIT in 1971 as a report on a three-week workshop of scientists. In the section of the book on its main recommendations, there is, predictably, a call for more funding of meteorological stations, ships, aircraft and satellites for climate monitoring. It says that n the Northern hemisphere there was a warming of 0.6C from 1880-1940, and then a cooling of 0.3C since 1940. It says that “While it is conceivable that man may have had a small part in the most recent climate changes we have just described, it is clear that natural causes must be sought”. There is a lot of discussion of particulate pollution, smog, changes of land use, some mention of CO2, and concern about ozone in the stratosphere. But there is nothing like the current CO2 hysteria, so I cannot see how anyone would have been convinced by this book that CO2-warming was a major problem. They’ll all have these emotional responses and these alone. Just give ’em time. Lol. Thanks for your comments and the link to your article at Climate Etc. Sorry it’s taken me so long to get back to you. I hadn’t seen your article, and I agree that it’s good to see that our analyses of what they’re saying gel pretty well. The link in your article to scaredscientists.com/ doesn’t work. Perhaps the Wayback machine might tell us something? apparently confirming that, as far as the emotional state of “the world’s greatest minds” (George Monbiot’s characterisation of IPCC authors) is concerned, it’s worse than we thought, which, ironically, is confirmed by the video interview with Michael Mann, which is entitled “Ironically it’s worse than we’ve been saying”. I admire your ability to sift through this stuff and report on it in a scientifically objective manner. My gut reaction is to react ironically and comment that, while Michael Mann says that, ironically, it’s worse than he said it was, I think it’s worse than I think it is. In fact I know it is. Because if I didn’t think it’s worse than I thought it was, then how could I know just how much worse than I thought it was it will get? Yes I waded through all those videos for some of my data. And indeed staying objective is hard. Fortunately there were only 20 at the time rather than hundreds, and Michael Mann added since. Think they’re up to about 40 now but I suspect hundreds is an optimism they’ll never achieve. And they may stop soon anyhow, once they realize that this level of emotive outpouring, including imagined scenarios way outside the predictions even of the IPCC, demonstrates their raw bias and hence is betraying them. Their underlying question is ‘why isn’t someone else doing something I can’t do or even imagine, about the thing I’m worried about and they’re not?’ The second question ‘why does nobody take us seriously’ is probably explained by the stupidity of the first.